Happy Halloween! Here are some books to get you in the creepy, crawl, oh so scary mood. Dracula by Bram Stoker: The classic vampire tale set in Transylvania, with the famous Dracula and Van Helsing. If you are looking for a Gothic Victorian tale, then this is the book for you. Find out where today’s vampire mania began. Pride and Prejudice and Zombies by Steve Hockensmith: Elizabeth and Darcy are now newlyweds, but are unable to have a honeymoon due to the zombies that have infiltrated their village. While out defending the town, Darcy is attacked leaving Elizabeth to find the antidote in London. 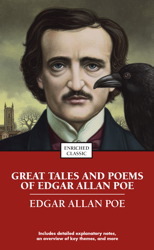 The Complete Works of Edgar Allen Poe: A classic American Gothic writer who brought us the frightful tales such as, “The Fall of the House of Usher”, “The Tell-Tale Heart”, “The Cask of Amontillado”, and of course “The Raven”. How can you not enjoy mysterious beating hearts, madness, and haunting ravens. Trick o r Treat Murder by Leslie Meier: Lucy is busy preparing for the Halloween festivities when an arsonist decides to set fire to Tinker’s Cove. Full o f ghostly galas and murder. And of course you have the entire paranormal romance and horror genre that would be perfect to read tonight. Authors such as J. R. Ward, Yasmine Galenorn, Charlaine Harris, Stephen King, Dean Koontz, and countless authors. Happy reading. The final chapter to the Percy Jackson series by Rick Riordan is The Last Olympian. The unavoidable war between the Titans and the Olympians is about to take place. Kronos heads to New York City to attack the unprotected Mount Olympus (why yes, the gods do live above the Empire State building) while the Olympians attempt to control the monster Typhon. Meanwhile, Percy and his gang of demigods set out to stop Kronos and protect Mount Olympus. In this exciting conclusion we also learn the fate of Percy and his prophecy. I have been told that the final battle with Kronos is very intense and is sure to have you glued to the book. However, a large portion of the book focuses on Percy and all of the tasks he completes prior to the fight with Kronos, making it less about the final battle and more about the characters. All and all, this is a wonderful series to read for all ages. If you are looking for a book to get your child into reading, give this series a try. It is full of suspense and humor to keep your child craving more. The series has been incredibly popular since last winter and everyone that I have talked to has loved it. Just a reminder, we will be discussing J. R. Ward’s book Covet Saturday October 30th at 1pm. This is the first book in Ward’s paranormal romance Fallen Angels series and should get us all in the mood for Halloween. Everyone is welcome to attend! If you have a book that you would like us to discuss, please feel free to tell us. We are always looking for more books. Written from the perspective of a former driver, now entrepreneur, this tale of India is both entertaining and disturbing. Starting in the Darkness; the interior of India where landlords still rule, every aspect of life is controlled, and children are sold into servitude; continuing to Delhi and then Bangalore, the main character, Balram, is writing a letter to the Premier of China. He is trying to explain all the things that the government of India will not show him on his visit. The poverty throughout is devastating. The caste system still exists and (unless you are willing to kill your master) no one can escape it. As the story unfolds, Balram explains why he had to kill his master and makes excuses for the murder, bribes and all the other things he does on his way to success. The White Tiger won the Booker award for fiction and many book groups are reading it. It was a quick read but much of it, will stay with me. The fourth book in the Percy Jackson series by Rick Riordan is The Battle of the Labyrinth. The tension is growing between Kronos and the Olympians and it seems like the war is coming. Percy and his friends head out to the labyrinth in hopes of stopping Kronos’s border invasions. To make things even more interesting, before Percy leaves school a new student appears and is being chased by demon cheerleaders. It seems that things are just going to get worse from here on out. Don’t worry, the suspense and humor continues on even in the fourth book. At this point in the series the characters are really starting to develop and come into their own, allowing the reader to become even more attached to the story. Most of the people that I have talked to said they had to hurry and pick-up the fifth book to find out the exciting conclusion. This is a completely different writing subject than the gritty wilderness series about Joe Pickett. The lead couple has adopted a baby girl who is being taken away from them. In the attempt to keep the baby, we get into political wrongdoing, gangs and worse. This is not for the faint of heart; but is extremely well written and we are with the parents, particularly the father, every step of the way. Having read the full earlier series this was a surprise, but a welcome one. CJ Box doesn’t lose his touch just because we aren’t in the wilderness any more; he is equally at home with the city life and the suspense doesn’t quit. Now he is on my list no matter what he writes. Here are our top sellers as of mid-October. As a side note, we have absolutely love Richard Castle’s newest novel, Naked Heat. If you enjoy watching the ABC show Castle, then checkout Heat Wave and Naked Heat. The books are written in a similar fashion to the show. It is funny and witty, with just enough tension between Nikki Heat and Jameson Rook to make you keep reading.